I mean, sometimes, the future doesn't bother to wait for itself and just shows up. Right there. In front of you. And you realize that we're all living in some sci-fi movie. Only it's here and now. Real life. All around us. 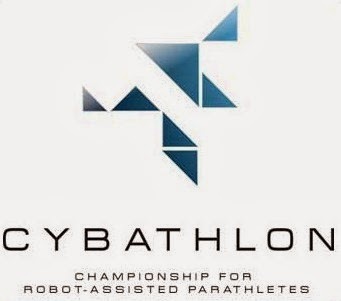 Cybathlon is the Olympics for robot-assisted parathletes. Pilots with complete Spinal Cord Injuries (SCI) will be equipped with Functional Electrical Stimulation (FES) devices, which will enable them to perform a pedaling movement on a cycling device that drives them on a circular course. Complete spinal cord injuries. Powered by FES to cycle on an oval. The powered exoskeletons are just as incredible. Pilots with complete thoracic or lumbar Spinal Cord Injuries (SCI) will be equipped with actuated exoskeletal devices, which will enable them to walk along a particular race course. Pilots will be equipped with brain-computer interfaces (BCIs) that will enable them to control an avatar in a racing game played on computers. The game will be either horse racing or car racing. Special visual and auditory effects will be used to make the game exciting also for the audience. The image will be displayed on large screens in the stadium. Last year, I asked The Six Million Dollar Question: How Will The Future of Prosthetics Affect Human Performance and Self Esteem? With the Cybathlon, I guess we're about to find out. Tickets go on sale in early 2016 and the event will be held in Zurich. Wouldn't this be the world's best science fair?? If you want your mind completely blown, check out the promo video for the event.